Tallbloke handily updated the Met Office forecast from January 2017 with actual temperatures since (see above chart), in order to see how good their forecasting prowess actually was. As you can see, it was pretty crap in reality! For the period 2017-21, they predicted an anomaly range between 0.42 and 0.89C. By stark contrast, the actual anomaly last year was 0.30C, way below the predictions. It is also worth highlighting that even the retrospective predictions (that is retrospectively modelling past temperatures using known variables) were at the high end of the bands till the mid 1990s, and since have been trundling along the bottom with the exception of the record El Nino of 2015/16. It is even more noticeable that the green band, (the range simulated by CMIP5 models that have not been initialised with observations), has overestimated warming by much more still. This is classic evidence that the models are still running much to hot. It hardly gives much confidence that the latest decadal forecast is going to be anymore accurate. As we can see below, the forecast for 2019-23 is still way above current levels. Note also that they now calculate the anomaly against 1850-1900, rather than 1981-2010, which is the accepted norm. As I pointed out before, the use of a “pre-industrial” temperature baseline allows them to make the numbers sound much bigger and scarier. 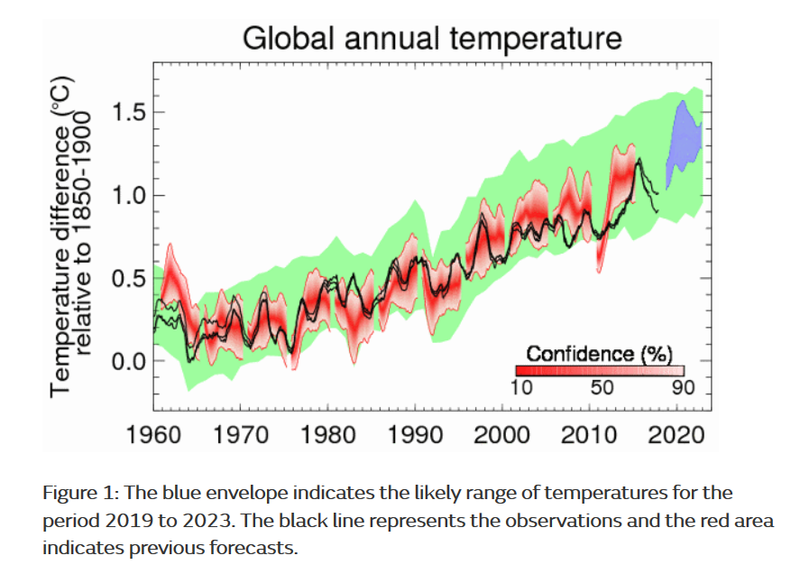 The Met Office now say that global temperature anomalies will range between 1.03 and 1.57C for 2019-23. In comparison, last year was 0.91C, and even 2016, when the effect of the El Nino was at its height, only reached 1.11C. Will temperatures really jump by half a degree or more in the next five years? What we can say is that average temperatures have only risen by about 0.5C since the 1940s. That is equivalent to 0.7C/century. I have never seen any convincing evidence such a small increase would be detrimental in any way. And I cannot believe that our descendants, given a hundred years to sort themselves out, could not adapt to such a change. I think I am correct in saying that the “forecasts” prior to 2000 are in fact “hindcasts” and therefore should be discounted. Are we still officially warming up since the Little Ice Age or is that warming thought to have ended? Keep up Cat – LIA never existed. That nice Mr Mann told me so. As far as I know, no one in your Met Office can explain why there was a Medieval Warm Period, or a Little Ice Age, or why the MWP and the LIA went away. Someone thinks what is happening now (not much) is explained by the use of carbon-based fuel. Apparently that idea is bonkers, or their projections would be better. If one is interested in “climate change”, then the 1850-1900 base may be reasonable. For example, my mother told me when she went to 1st grade in 1914 she had to walk in snow up to ‘here’ – at which point she pointed to her belt. Working backward, I determined that her belt height had doubled from that time. Point is – picking a proper base line is hard. Kids don’t walk to school now, so who cares? If one is interested in “weather” [Meteorology ?] then most of the information is compared to the “Normals” that currently use the 1981-2010 definition. About 3 years from now there will be a switch to a 1991-2020 “Normal” drfinition. Not to mention the Roman Warm Period. The WMO define climate as exhibiting a 30 year period. However, the main cycle that occurs seems to be about 60 years: 30 years can be very misleading about what is the normal range. 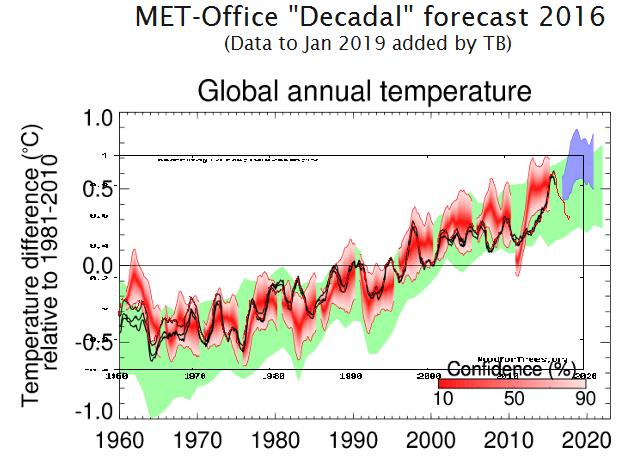 The Met Office decadal forecasts are running hot and so are their brains if they expect them to be anywhere near accurate. Decline is already under way on their own chart. Met Office — Model extreme temperature Office. A slight slip, I think you ‘thought’, “much too hot” and slipped in a typo, in the eighth sentence ? Who am I to question the great one. Keep up the good work. As a bit of a scientist (which bit? I do not know) my first thought when reading this was: how many measuring stations were there, second thought: what is the +/- error of the measuring device and third point: did they read at a fixed calendar point and average for each of the four seasons for consistency adjusting for hemispherical inversion? My next thought looking at the second graph was: how many satellites and computers & differing softwares were used to get the wider failures in the 21st century, compared to the relative accuracy of good old mercury(?) thermometers in the period 1970-1990? My final thought was, belatedly, where were the measurements, particularly the early ones, taken? Land, sea, air? All three? What if one reading point was in a country racked by conflict at some time? We are talking fractions of degrees variation, I guess, in all of those but the IPCC and Governments around the world are being asked to make policy, fiscal, transport, housing, energy generation, on an alarm based on +1.5° Centigrade over decades globally? That rise was mainly in Siberia at night. Ooh, I hope no insects were harmed in the making of that rise. A lot will depend on the next major ENSO event. Since the 2015-2016 super el nino conditions have either been neutral, or weak el nino and weak la nina. Another massive el nino could raise global temperatures by 0.4 degrees or more, which would put temperatures back into the range predicted by the met office. A large la nina could lower global temperatures by a few tenths of a degree, which would put them below the bottom end of the IPCC predictions. Personally I think it highly unlikely (based on the historical record) that there will be another massive el nino before we see a large la nina, but time will tell.